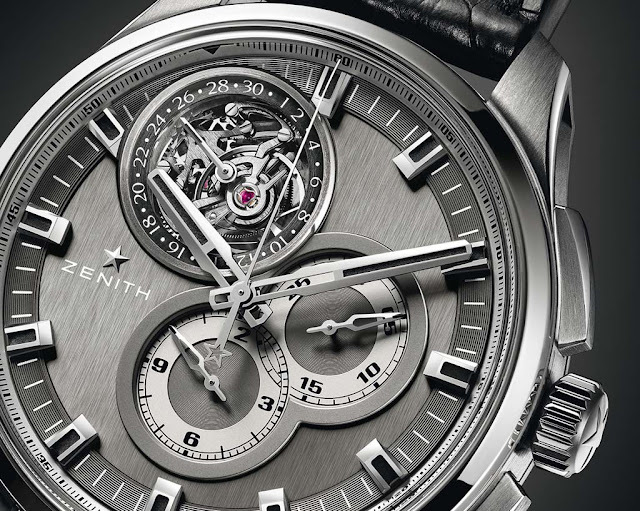 The new Zenith El Primero Tourbillon models combine the high frequency (36'000 vph) of the legendary El Primero chronograph movement developed by Zenith in 1969 with one of the most prestigious watchmaking feat, the tourbillon. Together with the two classic models in rose gold or stainless steel with a white or black lacquered dial, Zenith created a contemporary version in brushed titanium with a slate grey dial. This version features cut-out lugs and slender pushers for a much sportier look. The chronograph counters - 30-minute at 3 o'clock and 12-hour at 6 o’clock - are framed by an anthracite grey rim forming a figure eight shape that stands out against the brushed dial base. The rhodium-plated, faceted hour markers and hands are coated with black Super-LumiNova. tourbillon mechanism rotating once a minute also incorporates a small seconds display, while the patented date display appears on a disc placed around the circumference of the tourbillon carriage. The 45 mm-diameter case is water-resistant to 100 metres and features a sapphire crystal caseback to display the El Primero Calibre 4035D movement with its gold oscillating weight adorned with a "Côtes de Genève" motif. 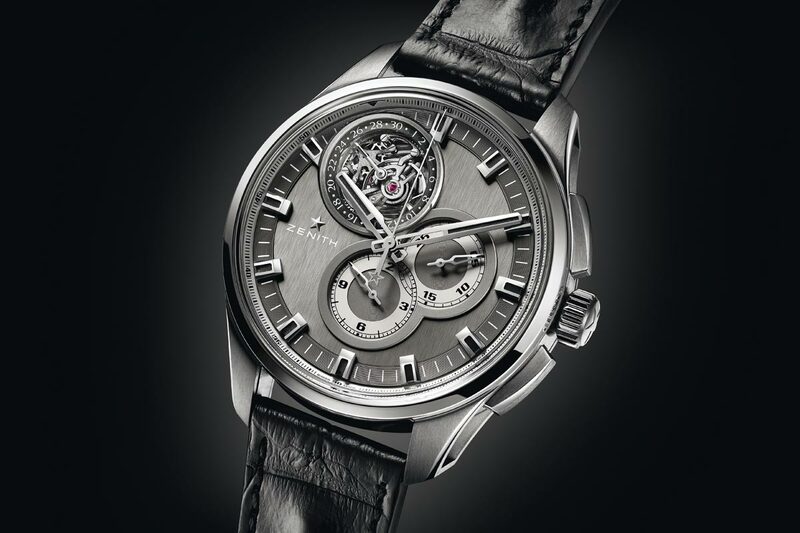 This 381-part movement is endowed with a 50-hour power reserve and graced with meticulous finishing. 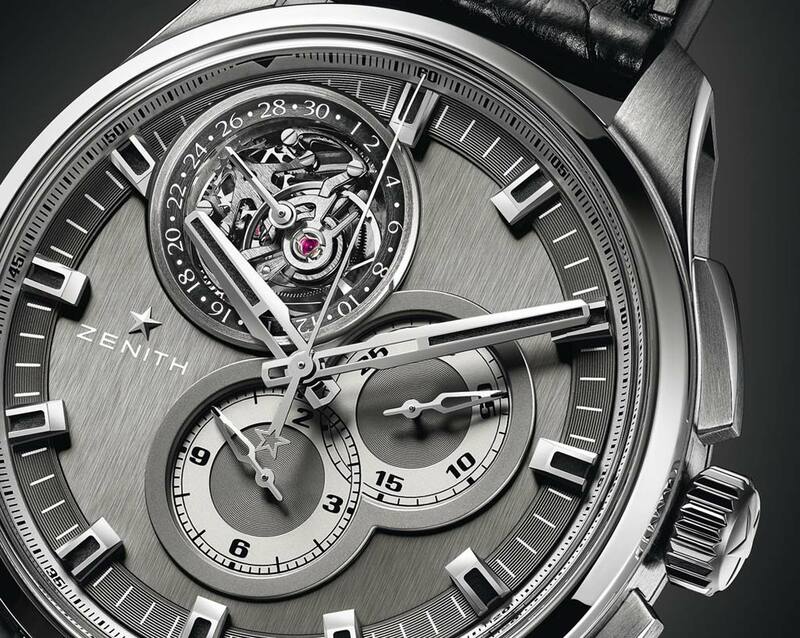 Zenith El Primero Tourbillon. 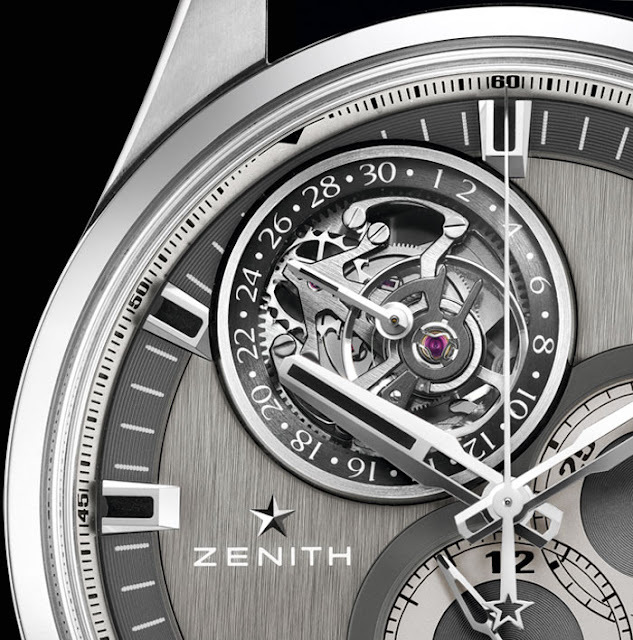 The new Zenith El Primero Tourbillon models combine the high frequency (36'000 vph) of the the legendary El Primero chronograph movement with a tourbillon. Indicative prices: Euro 65,400 / US$ 71,000 for the titanium contemporary model (ref. 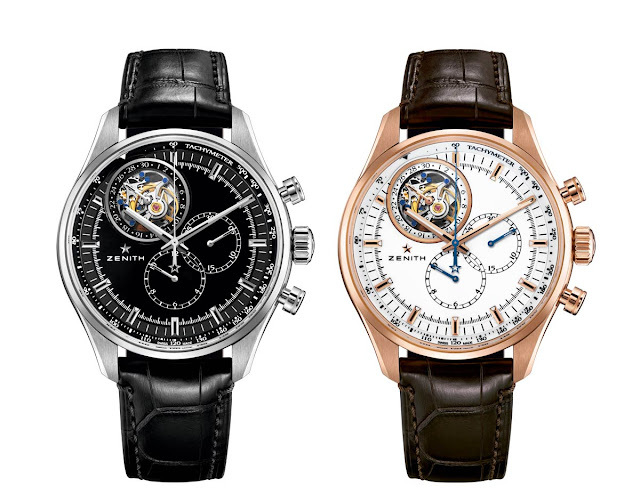 95.2260.4035/21.C759), Euro 55,300 / US$ 60,000 for the classic version in stainless steel (ref. 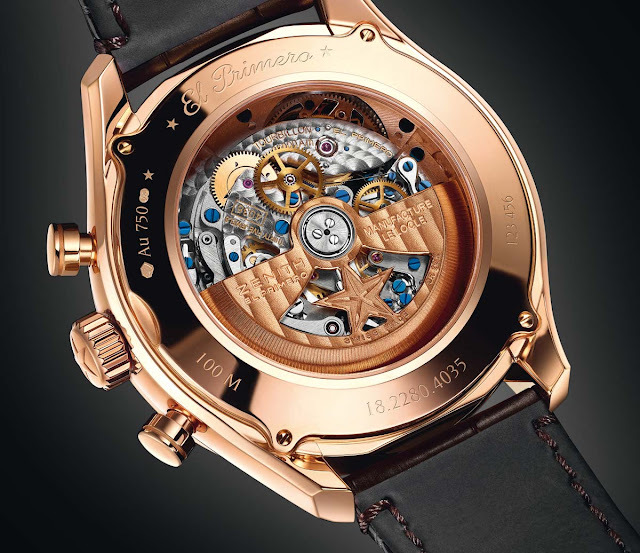 03.2280.4035/21.C714) and Euro 75,500 / US$ 83,000 for the rose gold one (ref. 18.2280.4035/01.C713). 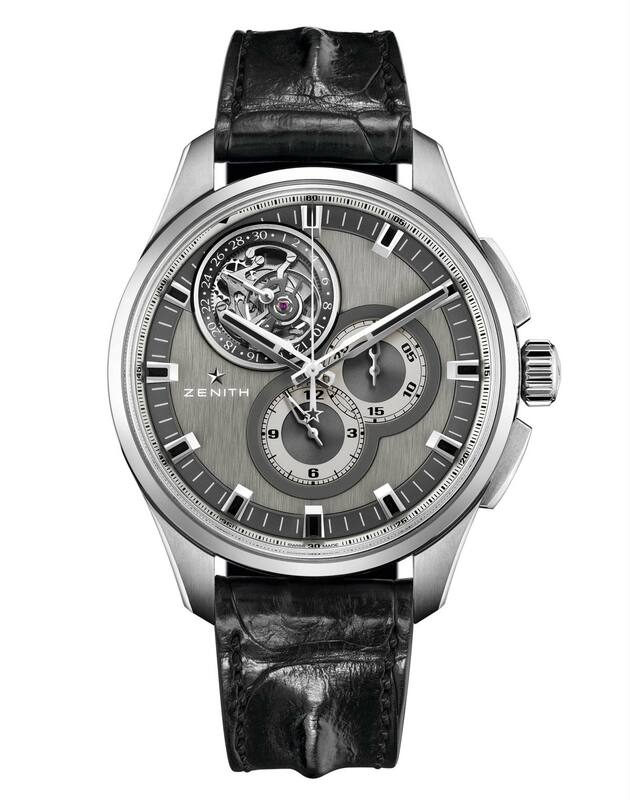 El Primero Tourbillon contemporary version in brushed titanium with a slate grey dial.